There is something about this island that is enchanting and quite literally, out of this world. This island, born of fire, has fascinated a lot of people and I can't figure out why, for the life of me, it took me this long to finally visit the place. Three days in this island was definitely not enough. This island just got a lot to be discovered and loved. 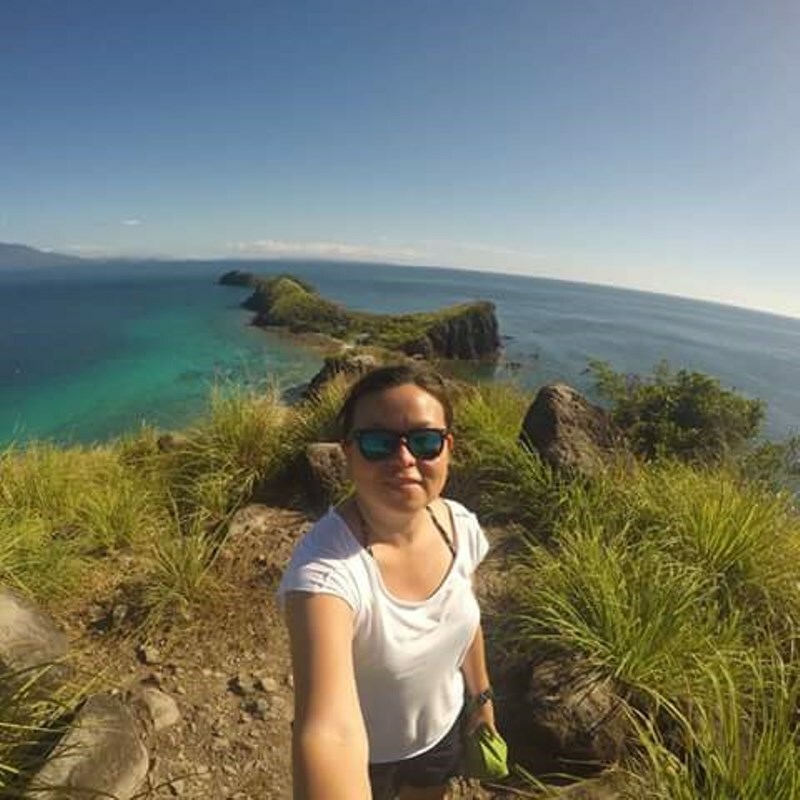 Our recent vacation in Camiguin got us going through lush mangrove forest; playing in white sands; plunging into refreshing and rejuvenating waters; reconnecting with our inner selves and the higher Being; and discovering other natural wonders. 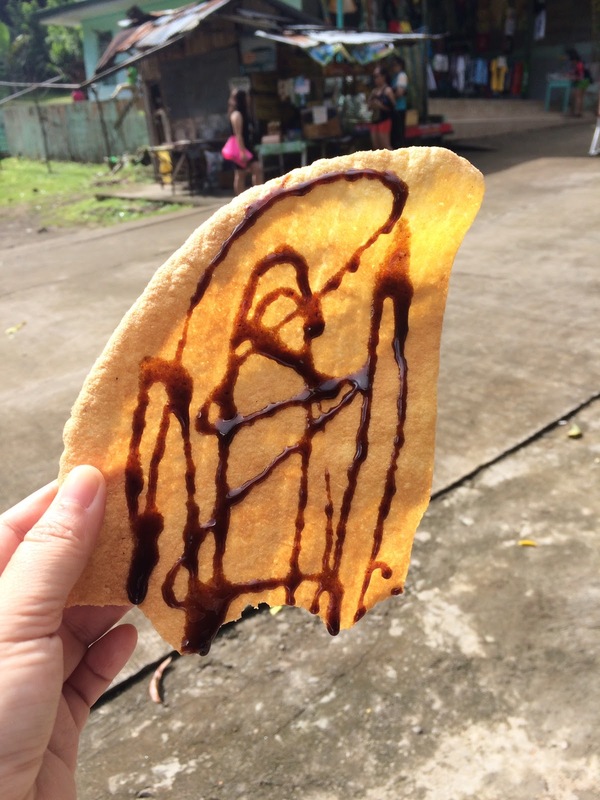 Our exploration started in Butuan City. 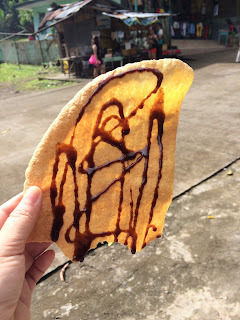 We spent an evening there and by early morning, we boarded a Cagayan de Oro bound bus. 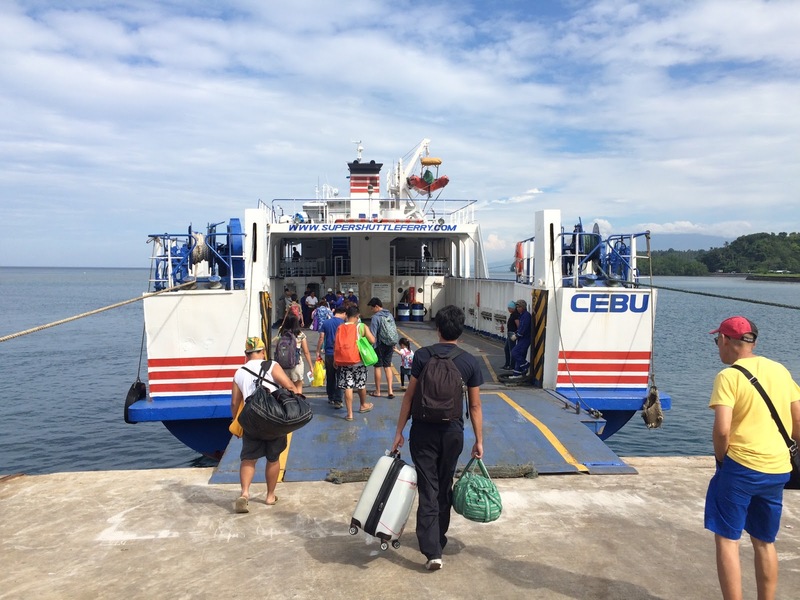 We were at the Balingoan Port before noon and got a 12:40 PM RORO to the island. It took us more than an hour to get to Benoni Port where Marvin (09186044304), the multicab driver we contracted, was already waiting for us. It was already mid afternoon, but we already wanted to start exploring. So, we did. First stop was the giant clams sanctuary. Located in Guinsiliban, Camiguin's smallest municipality, this sanctuary is home to seven, out of nine, species of giant clams in the world. A cooperative, Cantaan Centennial Multi-Purpose Cooperative, manages the place and proves that the best people to manage resources are the members of the community that lives in it. One of their volunteers is Lovely, who explained to us a lot about these giant mollusks. Lovely said she trained for five days and come here to the site to guide tourists at least twice a week. The sanctuary is located at Kibila Beach. We also got to observe giant clams up close as some of the clams were brought to the beach from their breeding pools. One of the tour guides explained to us that it takes five guys to lift the giant clams. 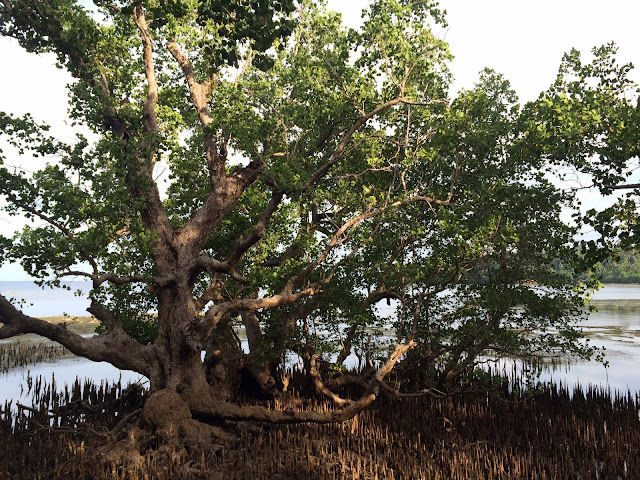 After the sanctuary, we went to the mangrove park. We almost skipped this one but am so glad we didn't because I was totally in awe of the place. The foot bridges were newly built and it got us walking through the mangrove forest. We took a lot of photo stops and enjoyed the fresh breeze, cool shade and sound of the waves. After the park, we decided to call it a day and start looking for a place to stay. Yes, we couldn't decide based on online recommendations where to stay. We looked at a place at the town center but none of us liked it. We then asked Marvin to bring us to the beach and we will look for a resort there. We then found Camiguin White Island Resort and decided to stay there. We booked a room, good for four, for P 1,200.00. We had an early start the following day. It drizzled just before we left the resort, which eventually became heavy rains. We thought we would postpone a bit but luckily we didn't because we had a calm weather waiting for us at our destination. White Island is an uninhabited white, horseshoe shaped, sandbar located about 1.4 kilometers off the northern shore of Mambajao. It is generally flat, with no trees, and it submerges during high tide. There are, however, stores in the island, wheret. The island is perfect for swimming, snorkeling and bird watching. It also offers majestic view of the main island. Lucky me. We spotted a vendor selling uni or sea urchin. My all time favorite. Our companion has been itching to climb Hibok Hibok but none of us wanted to accompany her, especially me because I can't climb after a mountain climbing accident. She got her fix in our next stop. 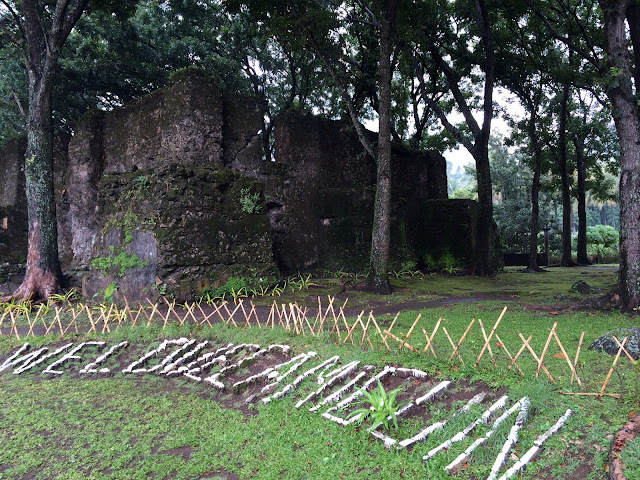 The Walkway to Old Volcano and Stations of the Cross is an 8 kilometer path with 14 human sized stations of the cross. Only the first 300 steps are concrete. The next site we visited is one of Camiguin's most unique and fascinating attractions. This one has a haunting quality so none of my traveling companions joined me. This site, like most of the island's attractions, was formed through earthquakes and volcanic eruptions. In the late 1800s, Mt. 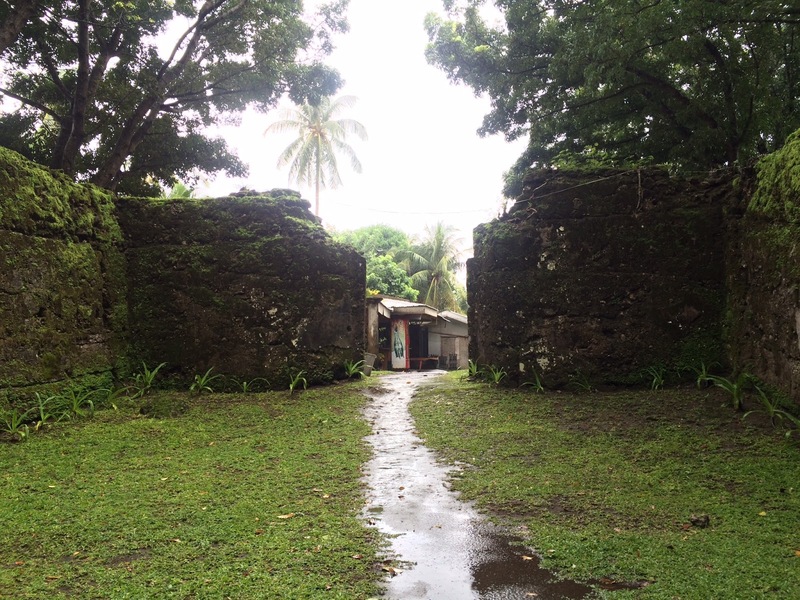 Vulcan, erupted and submerged the old town of Catarman, including a cemetery and church. but the real wonder is down there. The see was kinda rough that day. Good thing there was a guide willing to take me up to the site of the old cross. 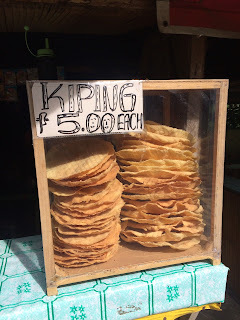 I paid P 250 (P 100 snorkeling fee is P 100 and P 150 guide fee). The first thing I noticed is Camiguin's colorful marine life. My guide took me to see an old tomb ..
and the old memorial cross. That was the highlight of the trip for me. It took us a while to get back to shore because of the waves but it didn't matter. There was so much to see down there. This church, located at Barangay Bonbon, Catarman, was built in the 16th century, and as mentioned, was destroyed during the late 1800s Vulcan eruption. What was left are the ruins of the church, the base of the bell tower and the convent. Trees and plants flourished in the site and the walls are now covered with moss. After our explorations, it was time for lunch and some cold splash. We had a refreshing dip and a filling lunch at the country's only soda water pool. For a minimal fee of P 20.00 each, we got to enjoy the lush scenery surrounding the pool and its cold, clear and clean sparkly water. According the websites, the cold spring water is infused with sulphuric elements and mineral deposits from the volcanoes, giving it a curious taste. I wouldn't know. I didn't attempt to taste it. The carbonated bubbles come from a subterranean spring. They say it also has healing effects on osteoporosis and cardiovascular diseases. After lunch is always a good time for naps but there were still a lot to see in Camiguin. Next place we visited was Tuasan Falls. We saw Tres Marias, the three domes adjacent to Hibok Hibok, on our way to the falls. Tuasan is a shorter drop than Katibawasan Falls but is just as beautiful. The steps leading to the falls are concrete, which means it is not one of those off the beaten path destinations. I really do not mind. It is favorable for me. Another refreshing dip in this island born of fire is this cold spring, which offers waters at 20 degrees Celsius. How's that for rejuvenation? There are cottages available here, just like in the soda pool, which makes it a nice place to hang around but we still had one stop in our itinerary so we just sampled the water for a few minutes then dried ourselves up a bit. We capped our day long exploration of the east side of Camiguin Island with much needed relaxation. 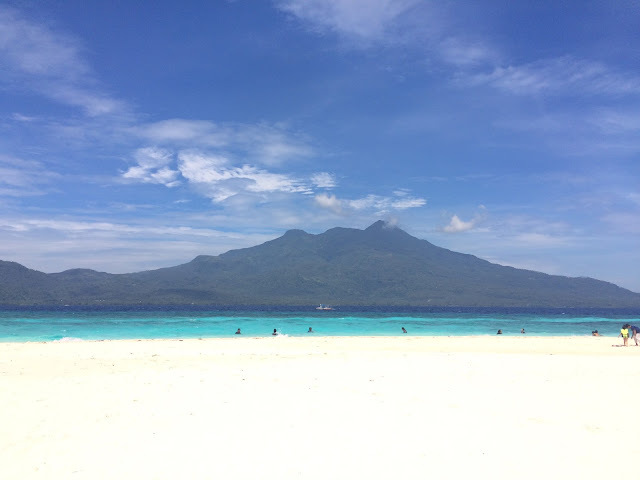 This is another Camiguin attraction of volcanic origins. 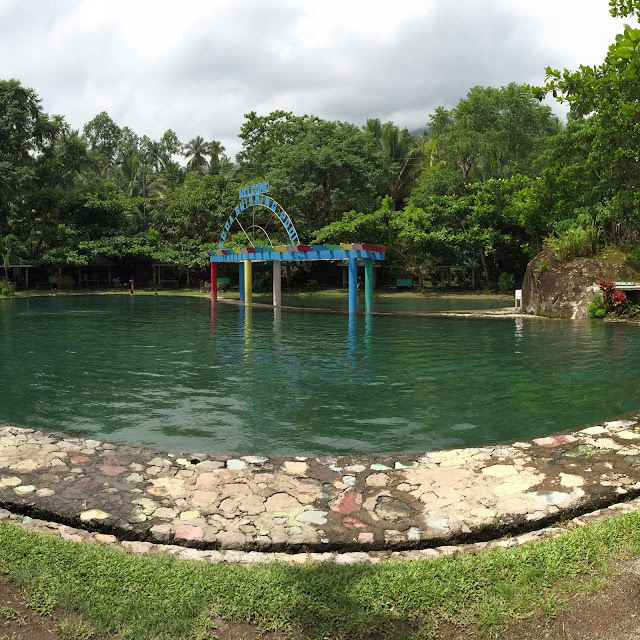 Ardent Hot Springs has about four hot springs arranged in cascades, of varying temperature, heated by Hibok Hibok. Temperature of the water starts at about 40 degrees celsius and is mixed with some colder water to give varying temperature. This is open 24/7. It was the most crowded attraction we visited and we were lucky to find our own spot. When you are in a good vacation, it always end too soon. Though we still have more than half a day left to explore Camiguin, we were already feeling the dread of leaving the island. 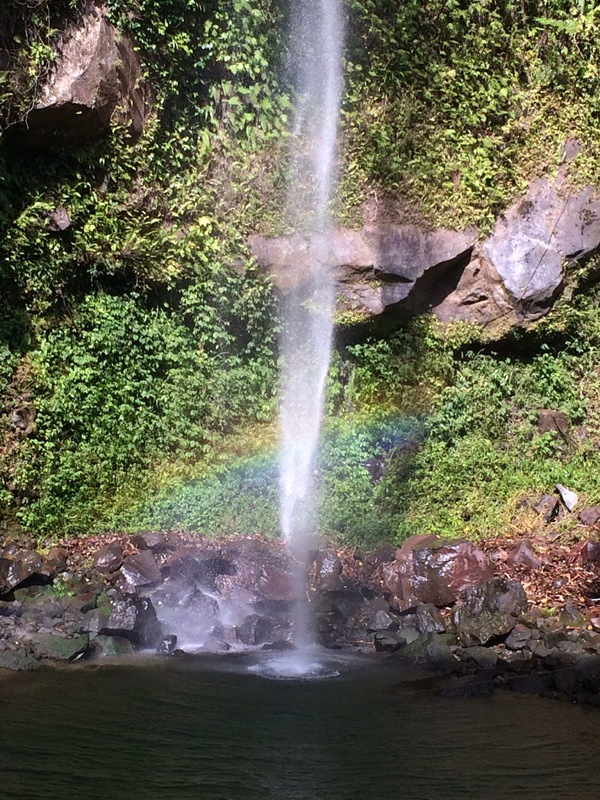 Good thing Camiguin really has a lot to keep us amazed like the rainbow waiting for us at Katibawasan Falls. 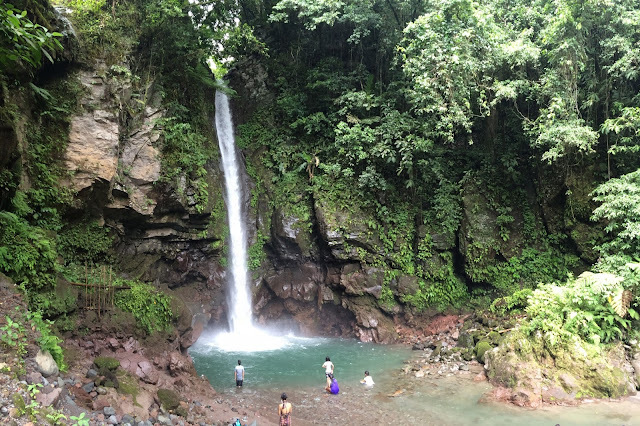 Katibawasan Falls features a 70 meter clear beautiful water plunging in a pool that is good for swimming. It is located at the foot of Mt. Timpoong. 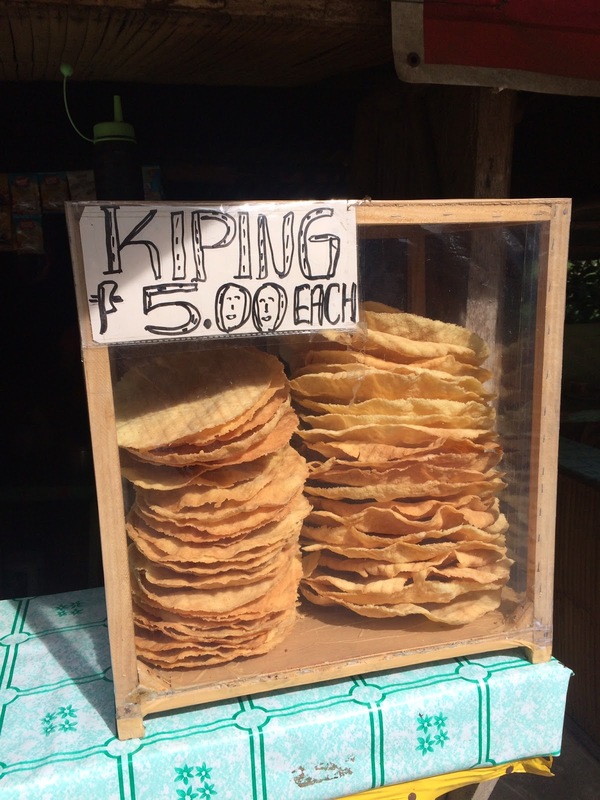 It was at Katibawasan Falls where we finally got to taste Camiguin's kiping drizzled with coconut jam. Good vibes continued. How can it not with these delightful creatures always game for a photo opp? 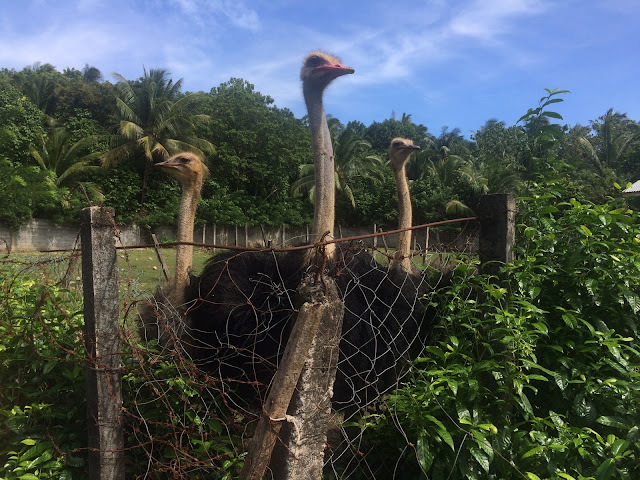 We continued our exploration of the west side of the island, which is nearer Benoni Port, at the Ostrich Farm located inside Camiguin's Provincial Animal Breeding and Ostrich Production Center. This is a research facility that breeds not only ostriches. Entrance fee is only P 5.00. This is like saving the best for last. If you ask me to describe my perfect island, that would be everything Mantigue is - white sands, clear blue, lush forest and friendly people. This island is 4 hectares of beauty. There are both natural and manmade picturesque spots. There are chairs and table for rent; fresh seafood and meat they can cook to your liking; and clean comfort rooms. Before leaving the island, we had a tour of the forest and our guide, Ikoy, made it delightful. He has a penchant for adjectives and he made us laugh. I think he is the main reason visitors should go on a tour in the island. We didn't come here for the zipline nor to go fishing. We went here for lunch with a view. It was our final stop and we decided to stay here and wait for the 2:40 PM RORO back to Balingoan Port. That was it. Our 3 day 2 nights Camiguin adventure, which pretty much covered most of the island's popular attractions, ended back at the Benoni Port. It was short. It was sweet. To top it off, we got the VIP room at the boat. At the port, we rode a van back to Cagayan de Oro, where we were welcomed by traffic and where we spent the night before taking our flight back home from Laguindingan Airport.